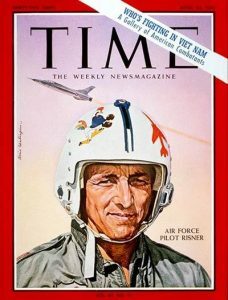 Risner on the cover of Time magazine. After Korea, Risner stayed in the Air Force. In the Vietnam era, now Lt. Col. Risner flew multiple missions, and became the first living recipient of the Air Force Cross, the second-highest military decoration for valor. In 1965 on his 55th combat mission, he was shot down over Vietnam. His captors found a copy of Time magazine with Risner on the cover, commemorating his Air Force Cross. The magazine profile “made him their ‘prized prisoner,’ which meant more abuse,” said Gen. Mark A. Welsh III, the Air Force chief of staff. Risner was tortured for 32 days, ending only when he was forced to sign a confession of “war crimes.” He was held as a Prisoner of War mostly at the infamous “Hanoi Hilton” — and was promoted to Colonel by the U.S. after his capture. Thus most of the time during his captivity, he was the highest ranking officer held as a POW. That made it Risner’s responsibility to maintain order and discipline among his men — even though he was often held in solitary confinement, and often tortured. He stayed in communication with his men with a complex “tap code,” which helped maintain morale and optimism. At one point Risner and two others organized a rebellion. When guards arrived to take the three men away for torture, the 40+ men in the cellblock started to sing the “Star Spangled Banner”. Six other cellblocks joined in. “The proud strains rang out over the 15-foot walls of the camp and reverberated outside in the streets of downtown Hanoi,” says fellow POW Lee Ellis, who says Risner’s credo was “Resist to the point of permanent physical or mental damage and then no more. Give as little as possible and then bounce back to resist again.” Risner said later that hearing the men sing while being led away made him “feel like I was 9 feet tall and could go bear hunting with a switch.” The U.S. Air Force Academy in Colorado Springs, Colo., now has a statue of Risner — it’s 9 feet tall. Risner was finally released in 1973 after seven years, four months, and 27 days of captivity, and published his story, The Passing of the Night: My Seven Years as a Prisoner of the North Vietnamese, to describe his years of torture and mistreatment by North Vietnam. He was awarded a second Air Force Cross for his valor as a prisoner of war; he was also awarded the Distinguished Service Medal, three Distinguished Flying Crosses, the Bronze Star, two Silver Stars, eight Air Medals, and three Purple Hearts. 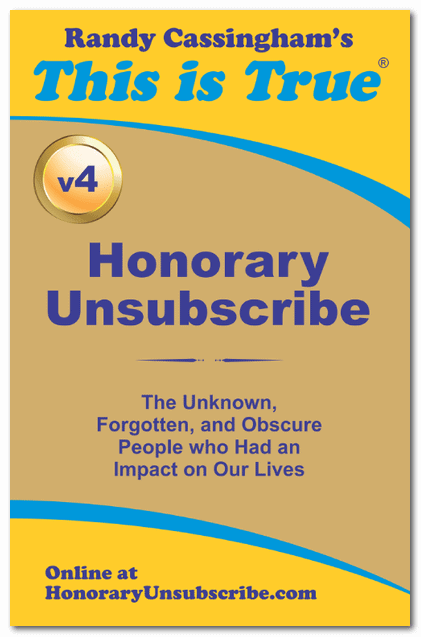 He retired in 1976 as a Brigadier General. James Robinson “Robbie” Risner died on October 22 after suffering several strokes. He was 88.